While the smart meter cover addresses one of the smart meter problems, there are many other strategies and products we use to reduce the overall EMF exposure in our home, work and sleep spaces. We do not recommend emf protection devices such as orgonite, shungite, scalar or quantum tech, pendants, crystals, or any other gizmos that supposedly "transmute", "neutralize", "absorb" or somehow "harmonize" EMFs. To our knowledge, none of these products have had true independent double-blind studies proving efficacy. Worse, many of these products may lull the individual into a false sense of security, discouraging them from taking common sense action to simply reduce exposure - ultimately making matters worse. When dealing with EMFs there are three effective strategies. 1) Eliminate 2) Shield 3) Increase Distance. Below are some of our favorite products that have been proven to reduce or eliminate various types of EMF. We use these products ourselves and consider them valuable additions to our overall strategy of optimizing our environment so our family can thrive. Cornet ED-88T Plus EMF Meter Business management guru Peter Drucker is often quoted as saying that "you can't manage what you can't measure." Well, this is especially true for EMF. We highly recommend that every family invest in a meter to measure what the actual microwave radiation, magnetic and electric fields are in your home. This will let you know where you stand before you decide what countermeasures are necessary. 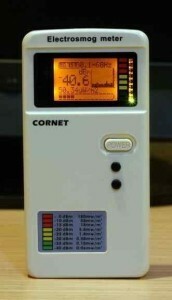 The Cornet ED-88T Plus EMF Meter is a great entry level EMF meter. 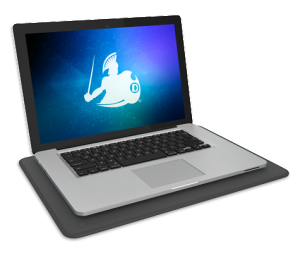 DefenderPad Laptop EMF Radiation Protection & Heat Shield by DefenderShield This is a device that helps reduce the EMFs coming from your computer. I never put the laptop on my lap without it. These pads will reduce some of the microwave radiation (if you use WiFi), along with the magnetic, electrical fields and heat that your laptop computer emits. Protecting the crown jewels is a high priority in our household (see cell phone discussion below). The world’s 1st Faraday Cage (Zero EMF) sauna. The Sauna Space innovative and patent-pending Oasis Shielding System shields you from all forms of man-made electric fields, both wired EF from your home’s dirty electricity and wireless RF from ambient blutooth, wifi, cellular and more. In the Oasis, you are protected from all electric field stress so your detox, mito-stim and meditative relaxation are maximized. When my cell phone is in my pocket, it is almost always on airplane mode. When I take calls it is almost always on speakerphone or through an airtube headset. However there may be instances where this is impossible or highly inconvenient - in those instances a shielded phone case is the best solution. EMF Consults - Have a professional come out and assess your home. Two trusted and Geovital certified EMF professional consultants are EMF Essentials and Shielded Healing. EMF Shielding Materials - While there are a growing number of EMF protection products coming out on the market, the absolute best products in the world are made by the Geovital Academy for Radiation Protection and Environmental Medicine, headquartered in Austria. To learn more about why Geovital T98 is the only EMF shielding paint worth investing in, watch the videos at the link here. T98 is the only paint on the market that performs at the highest frequencies. By applying two coats on a surface, shielding effectiveness of 99.999% against high frequency radiation can be achieved. T98 achieves protective attenuation of up to 50dB, at frequencies of up to 10Ghz! T98 also demonstrated exceptional performance (41dB) to the highest level tested at the time, 20 Ghz! With 5G and the Internet of Things (IOT) barreling toward us, we sleep better at night knowing our son's bedroom is shielded with T98. To order their products, you'll first need a consultant to come to your home to do an assessment. We had a Geovital consultant do an assessment of our home and it was an excellent investment. Blue Light Reducing Glasses: It is becoming widely understood that exposure to blue light from our devices and artificial lighting in the evening is reducing melatonin production. Melatonin promotes sleep among many other important health benefits. You can increase your brain’s production of this hormone by wearing these glasses after the sun goes down in the evening. I've tried MANY different kinds of blue light blocking glasses and what I love about Spectra 479 is that you can actually see what you are doing when you are wearing them. With other blue blockers, I found that they were so dark I would constantly be raising them so I could see what I was doing (which obviously defeats the purpose of wearing them in the first place). We also recommend that you download software to your devices to reduce your blue light exposure in the evenings. The free software f.lux is a good choice although I use the software IRIS on my PC - IRIS has considerably more functionality than f.lux. IRIS PRO is a one time purchase of $14.99 - it's good for life and worth every penny. Swapping out offensive bright white bulbs for these soft amber bulbs will also help. These simple measures along with avoiding screens past 9pm, eliminated my insomnia (that I struggled with for years).